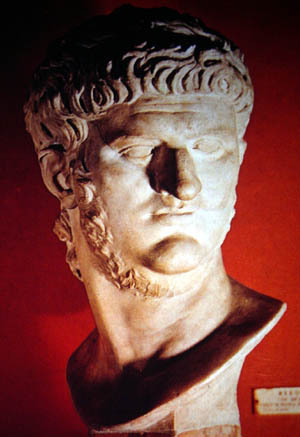 Nero Claudius Caesar Augustus Germanicus was Roman Emperor from 54 to 68. While his adoptive great uncle Claudius, who he succeeded, built many new roads, aqueducts and canals Nero, whose interests leaned more toward the cultural life of the Empire, had theatres built and promoted athletic games. Known for his extravagance, and also as a tyrant, he was responsible for many executions, including his mother’s (so much for the notion that blood is thicker than water). And on June 9, 68, amid rumours of his impending assassination, he became the first Roman Emperor to commit suicide. History lessons aside, my real reason for bringing him up, is a story (or rumour, as Tacitus insisted) that goes something like this: While the great fire of Rome burned for six days, Nero was off, playing his fiddle. Which, in itself, is technically incorrect. Apparently there were no fiddles in first century Rome. He would have been playing the lyre. But never mind. The point is, he was doing something else while the Empire, over which he ruled, was being destroyed. He was distracted. He wasn’t paying attention. He wasn’t focussed on what he should have been focussed on.